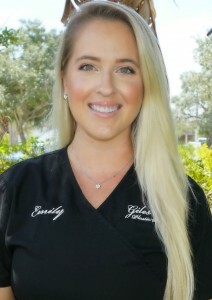 Emily Meloff-Graber is a Certified Surgical Technologist at Giles Breast & Body Plastic Surgery in Stuart, Florida. Emily loves working in the plastic surgery field because it gives her the opportunity to improve people’s lives – whether it be that person’s mind, body or soul. Emily finds her job to be very interesting and rewarding and she adores her co-workers. Most of all, Emily enjoys working with Dr. Giles. It is such a blessing to work for such a caring and talented plastic surgeon, Dr. Giles is a gem for sure! Emily is originally from the Great White North…Canada! She is married with two furry children; a lab named “Cinch” and an English Mastiff named “Phoenix”. Emily is also a certified make-up artist and she enjoys hunting, shopping and horseback riding. You will be in good hands at Giles Breast & Body Plastic Surgery with Emily at your side.